Labour Party conference passed a resolution opposing the housing act and calling on councils to “pause and review the Act's provisions” (full resolution reproduced below). It commits Labour to lead a campaign against the act. Islington council has called meetings for tenants warning of the impact of the housing act, particularly ‘pay to stay’ that could socially cleanse working class people from inner London. Unfortunately a small number of Labour councils such as Greenwich have pressed ahead issuing warning letters to their tenants despite the fact the government have yet to issue the regulations necessary to implement the act; they should “pause” and – as a minimum - consider following the Islington example. Implementation of the housing act would mean the end of what we would recognise as social housing at a time when there has never been a more desperate need to expand it. The branch – and Unite - have welcomed Jeremy Corbyns statement that there can be no solution to the housing crisis that doesn’t start with a mass programme of council house building – which he underlines in his speech today at the conference. Homelessness is rising while funding for services delivered by our members is cut and only today new figures show that evictions from the private rented sector have reached the highest level since records began. It is a reminder that the call for a decent minimum wage, an end to zero hours contracts and for a return to rent control is urgent. The branch has worked with the tenant based “Axe the act” campaign and will be supporting its “Housing Summit” on October 22nd. Unite Assistant General Secretary Steve Turner is committed to speak at this event. Labour has also dropped its support for 'right to buy' and now calls for its suspension in order to halt the reduction in social housing. "Labour will lead a campaign against the act"
On 9 August 2016 Shelter published research highlighting the plight of millions of working families who are struggling to afford sky-high housing costs. Shelter's chief executive said these families are 'stretched to breaking point and barely scraping by from one pay cheque to the next.' The research also reveals that a fifth of working parents face the prospect of being immediately unable to pay their next rent or mortgage payment if they lose their job. 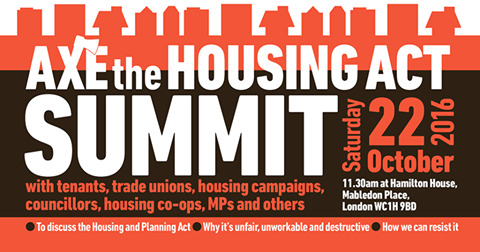 This Conference agrees that the Housing and Planning Act is an exercise in social cleansing, gerrymandering and a threat to all except landlords and developers making money from the housing crisis. Conference recognises that the Tories' Housing and Planning Act will, if implemented, disastrously increase the problems facing those in need of decent and affordable housing. Conference supports calls from councils across the country for the government to pause and review the Act's provisions. • Introduce a 'tenant tax' to increase the rent for many social housing tenants to unaffordable levels. • Force councils to sell off void council dwellings and ask registered providers to operate the Right-to-Buy, thus massively reducing stocks of vitally needed social rented housing. • Scrap the permanent, secure, social housing tenancies which provide stability to our most vulnerable communities. • Replace the planning requirement for social rented units with that for unaffordable starter homes. Labour will lead a campaign against the housing act and welcomes the Labour leadership's commitment to repeal the housing act and deliver 'genuinely affordable housing'. • A massive increase in the supply of council housing, including social rented housing. • A massive council house building programme which will both rebalance the economy by creating jobs and also empower local authorities with the necessary resources.